The Servo Pak connects to DMX-512 systems just like any standard DMX lighting fixture using 3-Pin XLR connectors for input & output. Each Servo Pak uses 7 DMX Channels. One Channel for Each Servo Motor. Values of 0 to 255 position the Servo Motor from Left to Right, Proportionally. Each channel may be inverted and has left/right limit settings. and the Amount of Left/Right Travel can be Adjusted. The Servo Pak works with all 3-wire PWM RC Servos, Micro-Mini to 1/4 Scale. 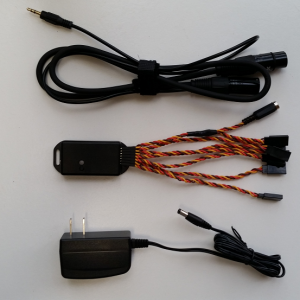 Connects the Servo Pak to the DMX-512 System. The Color of the Super Bright RGB LED on the Servo Pak follows the values of the First 3 DMX Channels. Removable Heavy Duty, 22awg, 6 inch Servo Extension Jumpers are Included and can be easily Replaced or Extended. High Quality, Regulated, 5V 2A Switching Power Supply is Included with the Servo Pak allows Input voltages from 90 to 240 VAC 50/60Hz for U.S. & Overseas Use, with plug adaptor.